Raja Todar Mal remains famous in India, over 400 years since his death in 1589. Todar Mal was one of the jewels of Emperor Akbar’s court along with other luminaries like Birbal. Todar Mal was born in Laharpur in the modern Indian state of Uttar Pradesh. Appointed to a rank of honour in 1560 by a very young Akbar, he rose in power and repute over the next three decades, becoming the finance minister in 1575.. He overhauled the revenue system of the ever expanding Mughal empire. Amongst the achievements he supervised was the first truly national survey of Indian agriculture and land revenue. This was performed systematically over a decade and the results published in exhaustive records (copies of this book of records are still in existence including in the British Library). This information lent itself to a more systematic and just system of taxation called “Dahshala”. The system took into accounts the worth of individual grains and crops, alongside standardised ways of measuring the land, thus ensuring a degree of fairness that had been lacking till then. The revenue system also led to more systematic organisation of provinces and districts into revenue divisions, many of which are still in existence in modern day India. Todar Mal also worked towards standardising the weights and measures system, an important part of the revenue system. The reliable revenue system helped ensure that Akbar did not need to depend upon waging war, treaties and plunder to enrich the Mughal treasuries. The steadier stream revenue in turn help provide a degree of stability, which allowed public expenditure as well as the promotion of arts and literature in Akbar’s time. Books such as the Akbarnama were commissioned and the Mughal library expanded to extraordinary lengths, with scores of artists employed to create and illustrate glorious books, epics and religious scriptures. Todar Mal is also credited with having helped rebuild the Kasi Vishwanath Temple in 1585. He helped several of the forts of the empire as well as several of his own palaces, many of which have fallen prey to the ravages of time. 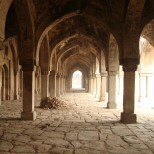 The Moti Mahal in Dariaganj in Delhi stands in disrepair still occupied by families who claim to be the 17th generation descendants. Perhaps a more subtle but more important achievement of Todar Mal and the other luminaries in Akbar’s court was that they perhaps influenced Akbar and his outlook on India and life. The promotion by Akbar of the Din-i-Ilahi, a religion amalgamating both Muslim, Sufi and Hindu beliefs would no doubt have been influenced by people like Todar Mal. A legacy that Indians today should rightfully remain proud off. This entry was posted on February 24, 2013 by reflectiveindian in All of India, North India and tagged Agra, Akbar, Bharat, Delhi, Hindustan, India, Todar, Vishwanath.